TFviews.com and ActionFigs.com bring you detailed photo coverage of Botcon 2013, straight from San Diego, California’s Town and Country Resort and Conference Center. 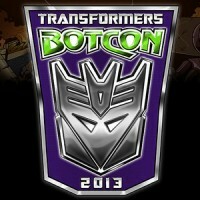 This year’s Botcon is June 27th – 30th. Botcon is the annual, official Transformers convention, with exclusive toys and souvenirs, panels, autographs, door prizes, fan contests, a dealer room, and of course, a Hasbro booth with looks at the newest Transformers products. Check out all the photos of your favorite new items, and don’t forget to view the larger-sized versions of each photo! Congratulations to OTFCC, Hasbro, and especially all the fans who made Botcon 2013 a great time. The results are in from Botcon 2013, and the newest inductees are… THESE GUYS! 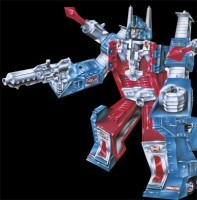 If you didn’t see our live panel coverage with the results, the inductees for Hasbro’s 2013 Transformers Hall of Fame, as voted on by the fans, are Ultra Magnus and Beast Wars Megatron. From Arcee, Prowl, and Rodimus, who each got around 15% of the votes, Ultra Magnus barely beat out the pack with 19%, while BW Megs took a commanding lead with an whopping 34% of the fan votes. June 29th, 2013 – TFviews is here at Botcon in San Diego, California to cover the Transformers news at the Hasbro panel. No photos are allowed at the panel, so it’s all descriptions from here. 11am PDT – Live panel coverage starts now, keep checking back for more info as it comes in. Hasbro thanking digital partners like TF Legends and Universe, and TF Prime. – Custom Kreons sneak peak – packs of Kreons that come with additional pieces to create your own special figure. – TF Prime Beast Hunters – 2014 Legion, Divebomb is an Autobot Defector and a Yankee fan, refuses to combine with the other guys. Rot Gut, “greatest name ever”, severe acid reflex, battle belch. 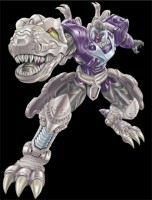 Ace Vehicon is sparkling white and fights autobots and stains. Bluestreak “sounds a lot Shaggy”. Blue body with white upper and green stuff. UPDATE –Voting has concluded. 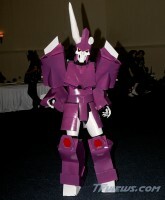 Look for Botcon coverage this weekend for the results. 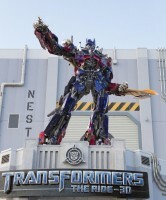 Optimus Prime is ready for battle – towering above the entrance to Universal Orlando Resort’s highly-anticipated, blockbuster attraction, TRANSFORMERS: The Ride – 3D. The addition of the authentically-sized leader of the Autobots Thursday morning, May 30, 2013 is one of the finishing touches to the attraction. Optimus Prime stands guard at 28 feet tall and nearly nine tons, beckoning recruits to join the resistance against the invading Decepticons. The mind-blowing, action-packed thrill ride, which was constructed in record time, officially opens June 20 at Universal Studios Florida.